You might think that having been afforded sanctuary in the UK from persecution in her homeland of Uganda this might have encouraged the left wing journalist Yasmin Alibhai Brown to express a little gratitude to Britain and the generosity of British people. Far from it. Instead she gives every impression of harbouring a deep dislike for a section of (white) British society and yet she is afforded various media bully pulpits to expound her grievance mongery. In true fake news media fashion, she even won the Columnist of the Year Broadsheet at the 2016 British Press Awards. In this article, AltNewsMedia examines her poisonous pedigree and asks the question; just what is her problem with Britain? She has, most recently, hit the headlines with the following tweet. This instantly attracted a response across the political spectrum. 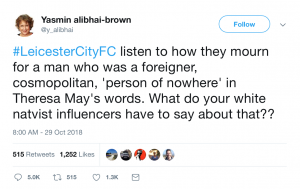 She references the death of Leicester City Chairman and Thai businessman Vichai Srivaddhanaprabha. 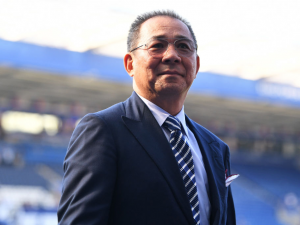 Mr Srivaddhanaprabha, along with four others, was killed on Saturday night when the helicopter he was travelling on crashed shortly after take off from the Leicester City King stadium – turning into a fireball. Furthermore to suggest that Mr Srivaddhanaprabha was a “person of nothing” is grotesque. 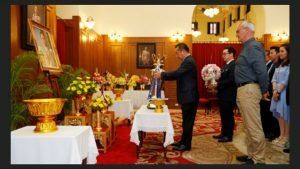 He was a proud Thai, loved the King of Thailand and brought the Premier League trophy to King Bhumibol’s shrine. He had all the values which British patriots respect and which Alibhai hates. Of course this is not the first time that Alibhai Brown has engaged in race baiting, her apparent forte. Back in 2015 she wrote this article on the then race to be next Labour leader. Again, she is focusing on skin colour as the determinant of the value of a candidate. Why are people of colour somehow “more exciting” than white people? Have they different and radical policies? Do they represent different Labour values? Or is purely because they are black (Lammy and Abbott) or Pakistani (Khan)? Turning to the Brexit vote, she once again spewed out her focus on race. So she slyly insinuates that all ‘racists” voted for the UK to become a sovereign Nation once again whilst carefully side-stepping whether ALL 17.4m Leave voters were actual racists. Of course she has no empirical evidence to suggest how ANY racists voted, she is merely idly speculating, but still keen to smear the biggest vote in British history. She was on the losing side, of course, so there is a degree of bitterness mixed in with her sad remainer tears. Back in 2009, according to former BBC producer and political commentator Rod Liddle, when asked in a TV interview what she thought of white people, she responded: “I don’t like them. I want them to be a lost species in a hundred years.” He has also pointed out that in a newspaper article in 2009, Alibhai-Brown used the words “stupid”, “vicious” and “scum” to describe white working-class people. Are these the words of someone who values living in our overwhelmingly white pluralist British society (82%) or someone who loathes us? Alibhai Brown was a supporter of the Liberal Democrats for some years but writing in 2009 she zeroed in on her key concern regarding this Party. Can you guess what it might be? Alibhai-Brown is a Shia Muslim. When Donald Trump was elected back in 2016 she instantly wrote “There’s nothing for Muslims in Trump’s America”. She is perfectly entitled to that opinion, of course, but she forgot to tell us where she thinks these Muslims should go, given her contention that there is “nothing” for them in the US? I suppose they could try a Shia theocracy? Alibhai-Brown describes herself as a “lefty liberal, anti-racist, feminist Muslim” Yet leaving aside the absolute oxymoron of being a “Feminist Muslim” the truth is that her track record points to an unhealthy obsession over race and a dislike of many white British people. To try and shelter behind the ubiquitous “anti-racist” epithet so beloved by the left fools no one. The United Kingdom generously provided Yasmin Alibhai Brown with a place of sanctuary back in 1972. Since then she has repaid that kindness by spewing out an endless diatribe of Brit-hate. To answer the question AltNewsMedia posed at the beginning of this article, her problem with Britain seems to be patriotic white British people. What does that make her?